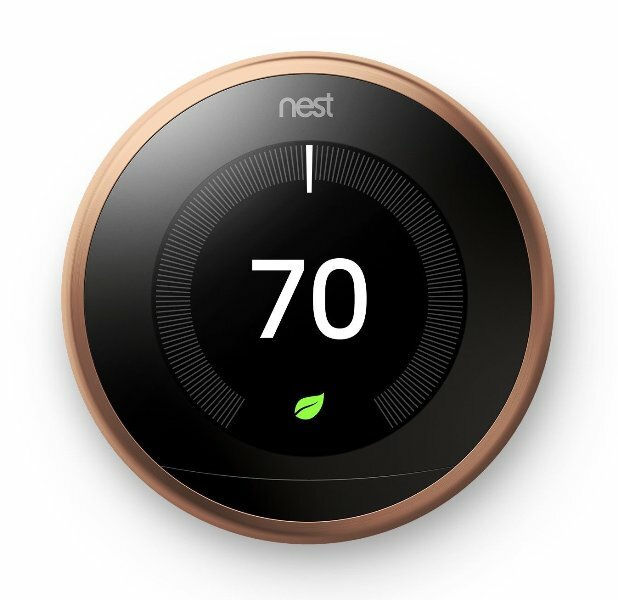 The Nest Learning Thermostat features a thinner and sleeker design coupled with a sharper display and an easy -to-read temperature control. 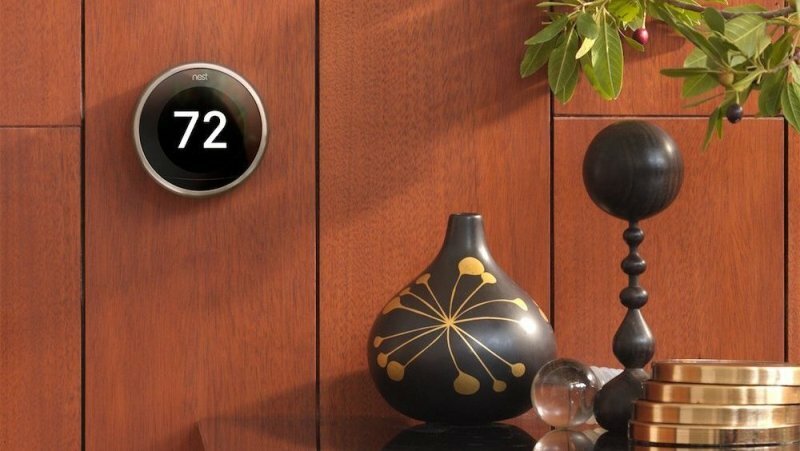 In fact, this 3rd generation Nest Learning Thermostat features an Auto-Schedule that allows it to learn from you and then programs itself while its sensors and algorithms help to save energy when no one is home. Additionally, this thermostat can be controlled from anywhere using your Smartphone, tablet or laptop and it’s also very easy to setup or install. Lastly, this thermostat is Wi-Fi enabled and features several sensors coupled with a powerful built-in rechargeable lithium-ion battery. On top of that, its Farsight feature allows it to light-up when it sees you coming and then shows you the time or temperature from across the room. A thinner & sleeker design with copper ring. A Bigger & High resolution color screen. A 3rd generation Learning Thermostat. First thermostat to get ENERGY STAR certified. It can be controlled from your phone, tablet or laptop. Saves energy when no one’s home. 3 Heating-stages (W1, W2, W3). Heat pump with auxiliary and emergency heat. Wi-Fi connectivity via Internet access. Languages: English, French, Spanish & Dutch. 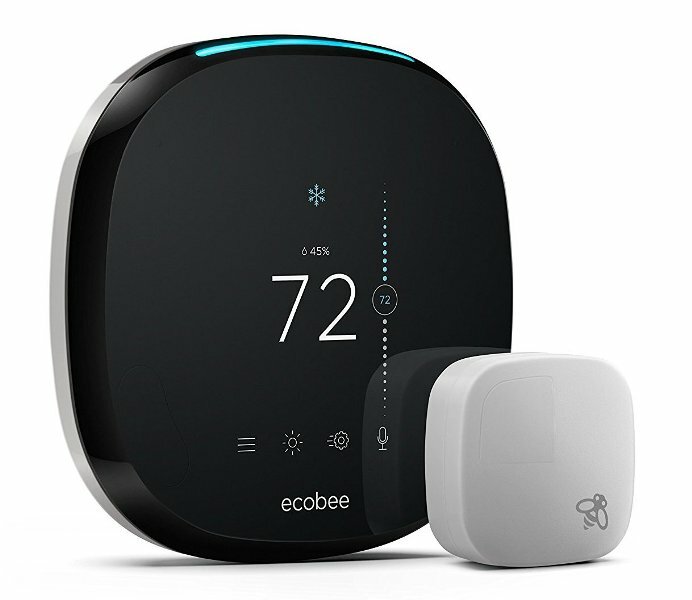 The ecobee4 Thermostat with Sensor comes with built-in Alexa Voice Service so that you can ask it to set a timer, read you the news, adjust temperature and a lot more. This thermostat features Far-field voice technology that enables it to hear you from across the room while the integrated room-sensors help manage hot or cold spots within your home hence providing comfort to the rooms that matter most. Additionally, this thermostat can be controlled from anywhere using your Android or iOS devices and also works with Apple HomeKit, Google Assistant, Samsung SmartThings & a lot more. Lastly, this thermostat is very easy to install and saves up to 23% on heating and cooling costs each year. Comes with built-in Amazon Alexa Voice Service. Far-field voice technology in-order to hear you from across the room. Comes with a room sensor to manage hot & cold spots. ecobee mobile-app for use on Android and iOS devices. Easy adjustment of temperature and comfort settings. Saves you up to 23% on heating and cooling bills. Works with Apple HomeKit, Google Assistant, Samsung SmartThings & more. Easy to setup or install. Supports Conventional (2H/2C) and Heat pumps (4H/2C). Supports Humidifiers, Dehumidifiers, Ventilators & HRV/ERV. 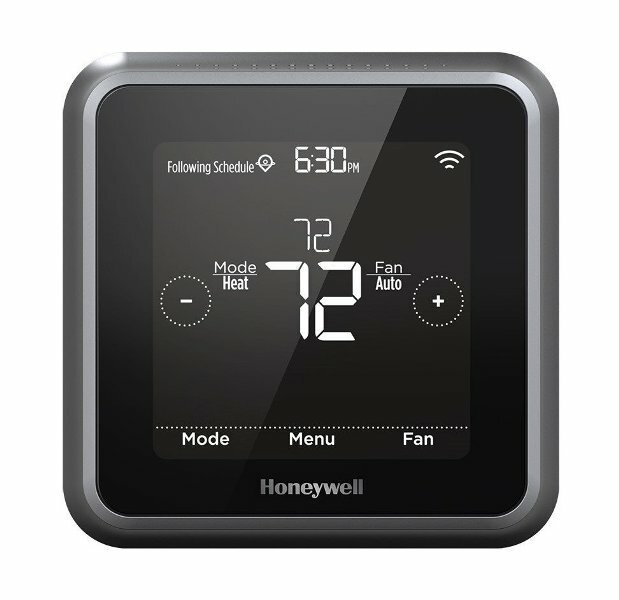 The Honeywell RCHT8610WF2006 Lyric T5 is a Wi-Fi Smart 7 Day Programmable Touchscreen Thermostat with Geofencing and even works with Amazon Alexa for voice control. Additionally, this thermostat also works with Apple HomeKit with voice control using Siri which is an Apple voice assistant while its 7-Day Flexible Scheduling or Location Based Temperature control uses Geofencing technology to keep track of your smart phone’s location. On the other hand, this thermostat features adaptive-recovery technology which learns how long it takes to achieve the right temperature at the right time and then automatically runs your system to provide your desired temperatures with an auto change from heating to cooling while the Smart-Alert feature keeps you informed of any filter changes and extreme temperature warnings. Lastly, the Honeywell RCHT8610WF2006 Lyric T5 thermostat requires a C-Wire and will not work without it. Honeywell Lyric is Wi-Fi Enabled. It works with Alexa for voice control. It works with Apple HomeKit with voice control using Siri. Location Based Temperature control via Geofencing. Adaptive recovery learns the right temperatures & automatically runs the system. Smart Alert function keeps you informed of any changes. Works with Honeywell’s Lyric family of products. Lyric app is compatible with Android & iOS Smartphones or tablets. Easy control of heating/cooling anywhere using Lyric app. Geofencing technology to track your location and updates. HomeKit technology which is used by many smart devices. This Product requires a C-Wire & won’t without it. 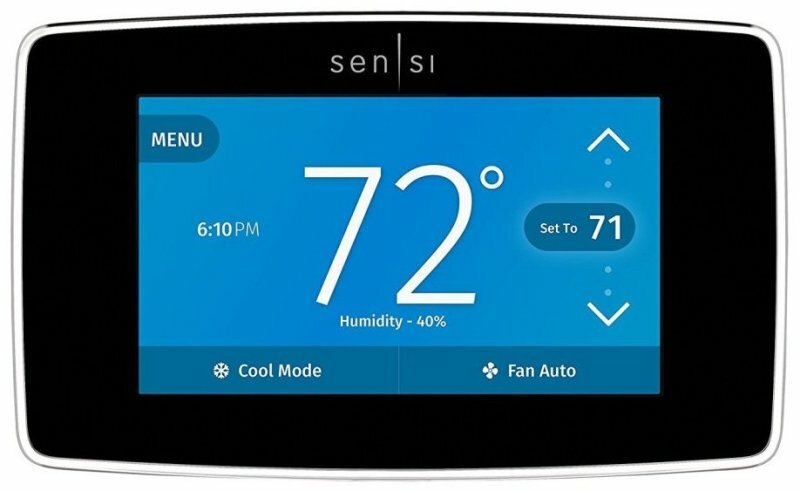 The Emerson Sensi Touch is a Wi-Fi Thermostat with Touchscreen Color Display for Smart Homes coupled with a free Sensi app for Android and iOS devices in order to help you remotely control your home temperatures comfortably from anywhere. 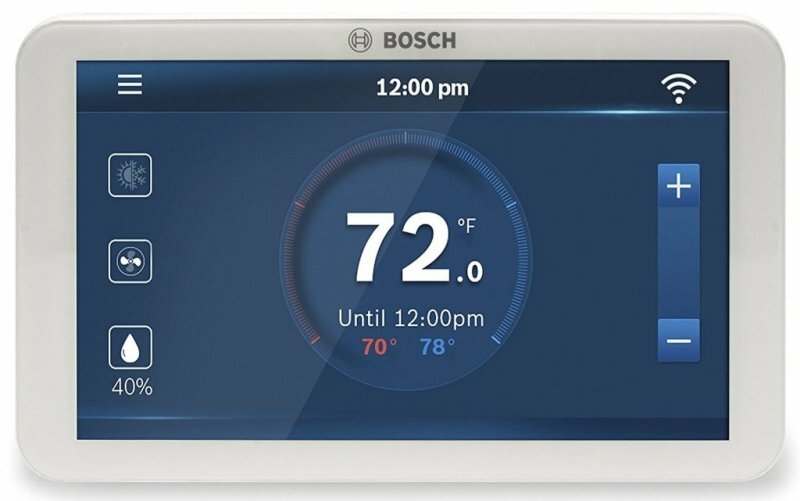 In fact, its HD touchscreen color display is very easy-to-read and features back glow intuitive menus while the Smart-alert feature detects extreme temperature and humidity levels in your home and alerts you if something isn’t right. On the other hand, this thermostat is compatible with Amazon Alexa, Apple HomeKit and Wink whereby it can work with Google-Home and Google-Assistant via a free Wink-app while the location-based temperature control (Geofencing) helps you save money on HVAC related energy costs. 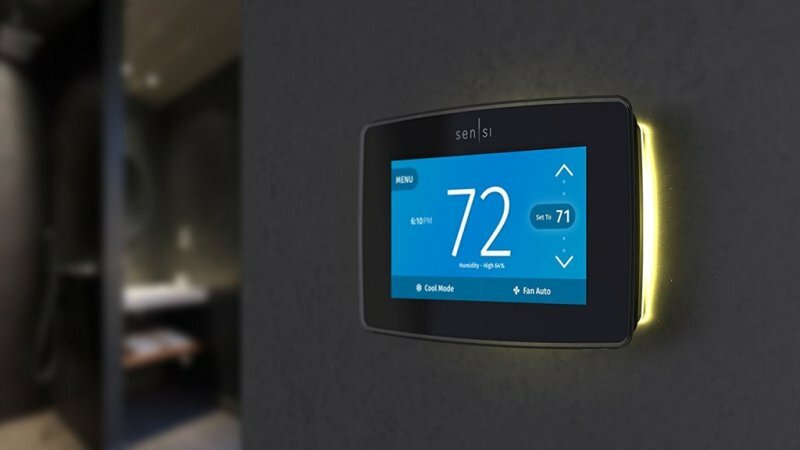 Additionally, this thermostat is very easy to install because it comes with intuitive step-by-step instructions on the free Sensi mobile-App while its thoughtful design features illuminated easy-click terminals. Lastly, the Emerson Sensi Touch is compatible with HVAC systems in most homes but requires a common wire (c-wire) to operate. Features location-based temperature control with Geofencing. 7-day programmable heating and cooling schedules. Remotely control your home from your Smartphone. Free Sensi-App for Android and iOS devices. Features an HD touchscreen color display with back glow and intuitive menus. Integrates with Amazon Alexa, Apple HomeKit and Wink. Save you money on HVAC related energy costs. Extensive compatibility with HVAC systems in most homes. Easy DIY installation with intuitive, step-by-step instructions. Illuminated easy-click terminals and built-in level for easy installation. Smart-alert detects extreme temperatures and then alerts you. A common wire (c-wire) is required for ALL system types. Compatible Conventional systems up to 2-stages of heating & cooling (2H/2C). Compatible with Heat Only and Cool Only systems. Compatible Heat Pump systems (With or Without Aux). Compatible Gas, Oil and Electric systems. Compatible Geothermal and Dual-fuel systems. The Bosch Connected Control Wi-Fi Thermostat is Alexa-Enabled to allow you control the entire home using just your voice in-order to save energy. 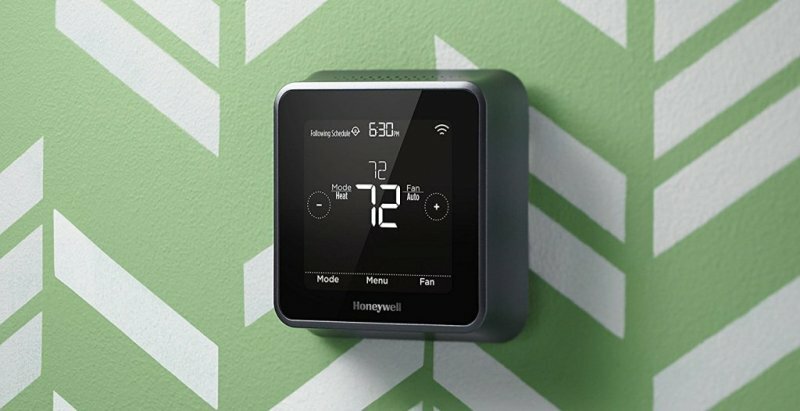 In fact, this internet-connected thermostat can automatically turn itself on and off according to a pre-programmed schedule in-order to maintain temperatures when you’re away from home while its Full-color, 5-inch touchscreen display allows for easy scheduling so as to provide the most comfortable temperatures for your home. On the other hand, this thermostat can be connected via Wi-Fi to control temperatures and settings from your Smartphone or tablet anywhere but it’s also fully-functional without Wi-Fi connectivity. Additionally, the BCC100-App will help you to connect to an unlimited number of thermostats and manage up to 4-schedules per thermostat. Lastly, this thermostat is Compatible with different home heating and cooling systems on the market today but a C-wire is required to power-up this unit. Internet-connected thermostat that saves energy. Alexa-enabled for easy and quick voice-control. Wi-Fi Ready Connection to your smart phone or tablet. Full color 5-inch display touchscreen with an Easy-to-Use Interface. Automatically turns itself on & off according to a pre-programmed schedule. Access your local weather forecast from this thermostat. Follows preset or user-defined schedules. Compatible with majority of HVAC systems on the market. BCC100 app allows you to connect an unlimited number of thermostats. A C-wire is required to power-up this unit. Compatible with Heat Pump systems (4 Heat, 2 Cool). Compatible Conventional (2 Heat, 2 Cool) systems. It’s fully functional without Wi-Fi as well. Features a Vacation Mode that follows a user-defined schedule. 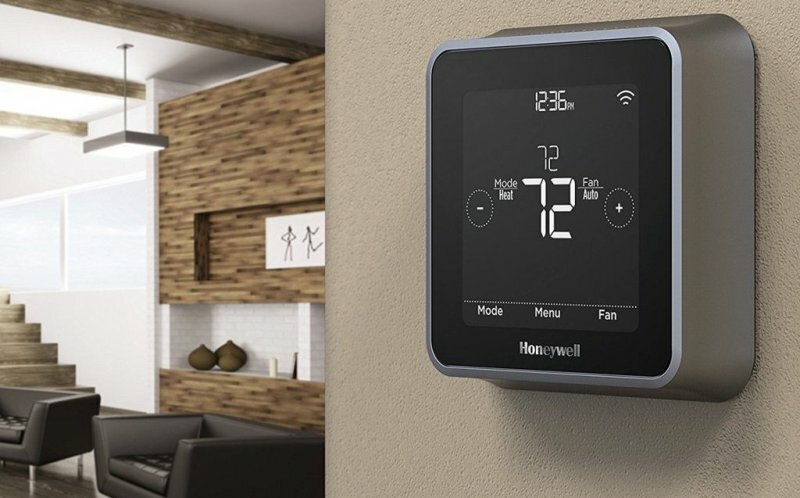 All the featured Smart Thermostats are programmable, compatible with most HVAC systems and Alexa-enabled for easy voice-control while at home in 2019. In fact, these thermostats can automatically control your home temperatures using a pre-programmed schedule but you can also use Mobile-Apps to control these thermostats from anywhere while using your Smartphone or tablet. Lastly, these Thermostats are compatible with majority of HVAC systems on the market and this actually makes them a perfect choice for home-use.